Many years ago, when I began selling my handmade jewelry designs on the internet, I started to get requests from people for special order items. 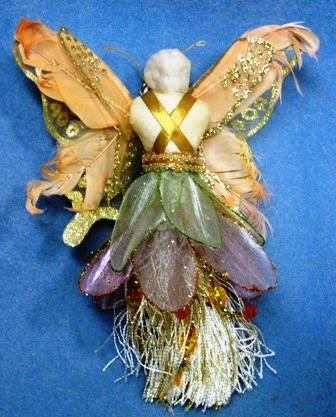 You name it - they came in - everything from pieces featuring particular saints, to family members to specific themes. I wasn't sure if handling custom orders was the right thing for me to do at the time, but in hindsight, it ended up being a good move for me, business-wise. In the 14 years I have been designing and selling jewelry online, I'd have to estimate that nearly one-third of my retail sales are custom orders. By accepting custom orders, I found that I was given "free" advertising and new business from people who'd order from me because they couldn't find exactly what they wanted in the marketplace. 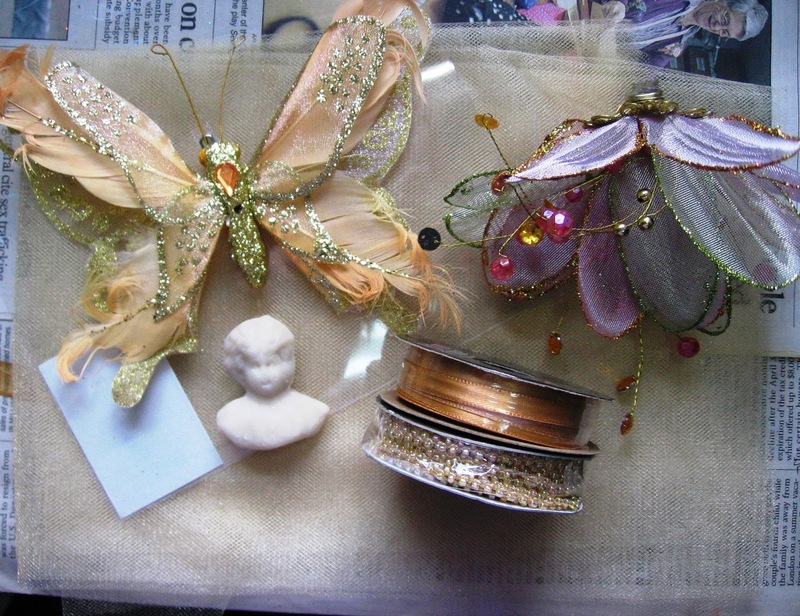 Word of mouth spreads, and the next thing I knew, I began receiving orders from friends and family members of customers who wanted their own individually created jewelry pieces. On EBay and Etsy, where I sell many of my designs, the custom order requests for loaded charm bracelets, domino pendants and wooden cross necklaces came in several times a week. 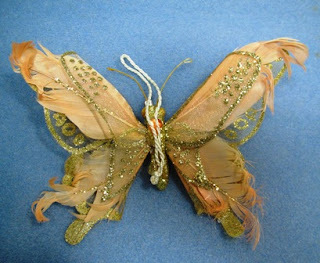 To accommodate these requests, I set up special "custom" listings for people to order these items through the sites without having to contact me first. Upon checkout, they let me know the specification for their designs. Sometimes, I've found that if one person is looking for something in particular, it results in additional sales to others. 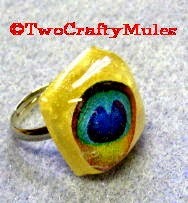 For example, a person with the last name of "peacock" asked me to design some peacock-themed resin jewelry pieces for them. I ended up getting numerous requests for peacock-related designs from others who saw the original design and I had a hard time keeping them in stock. The special orders I initially accepted have expanded into wholesale orders for businesses, as well. 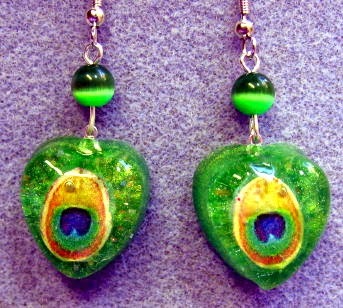 Several years ago, the Director of the Jell-O Museum gift shop in New York purchased a pair of polymer clay Jell-O salad earrings from me on EBay. This was the start of a regular business relationship for us. 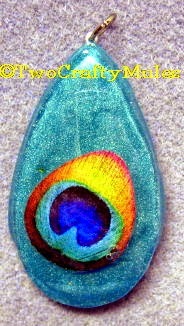 The museum has provided me with specific images they want used in their jewelry designs; I make all of the Jell-O earrings for their gift shop and have been doing so for many years now. I have expanded this to include novelty polymer clay candy piece earrings for a candy store in Pennsylvania, among other entities. 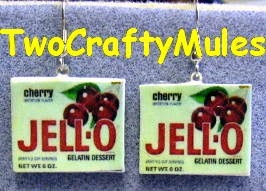 The Jell-O earrings that started it all for me with the Jell-O Museum gift shop in New York. 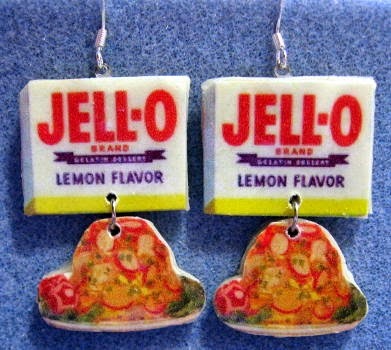 Jell-O earrings similar to those being sold at the Jell-O Museum gift shop. 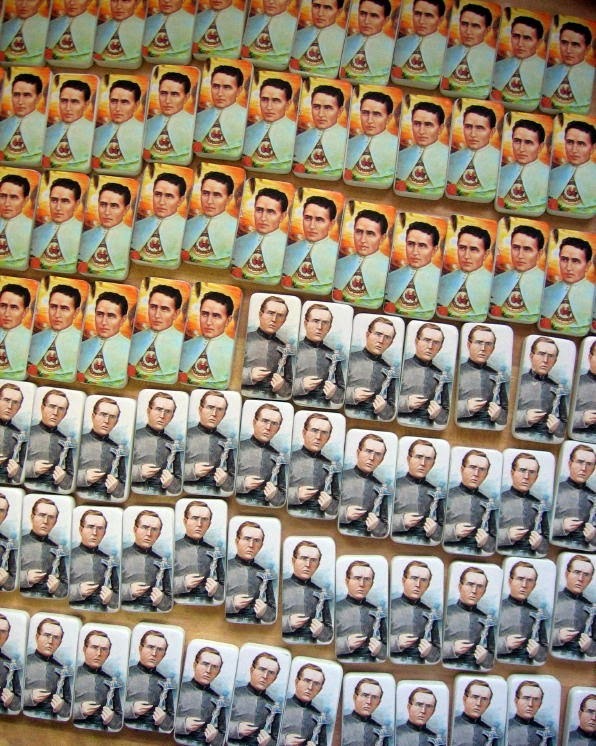 Saint Damien of Molokai pendants in process. 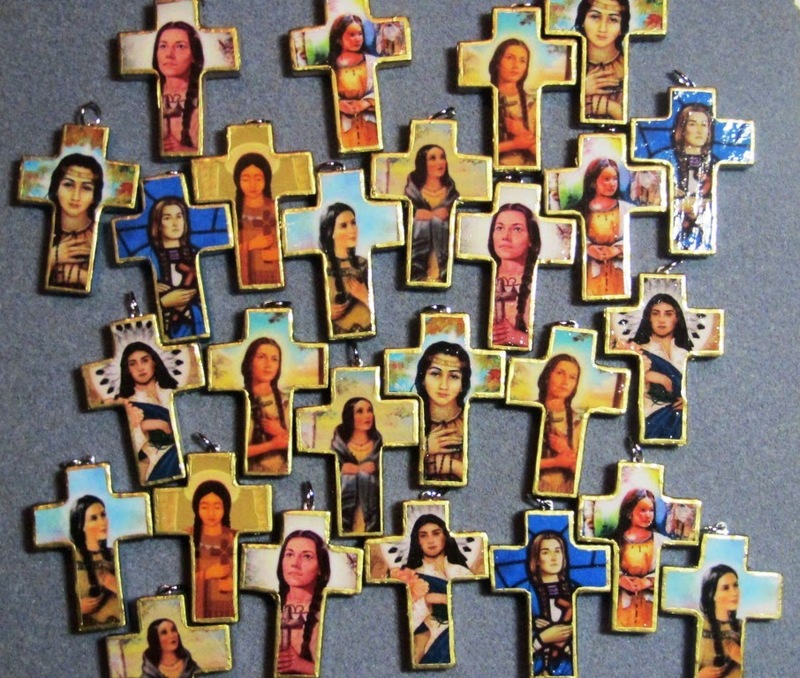 St. Kateri Tekawitha pendants in process for a St. Kateri Tekakwitha conference this summer. 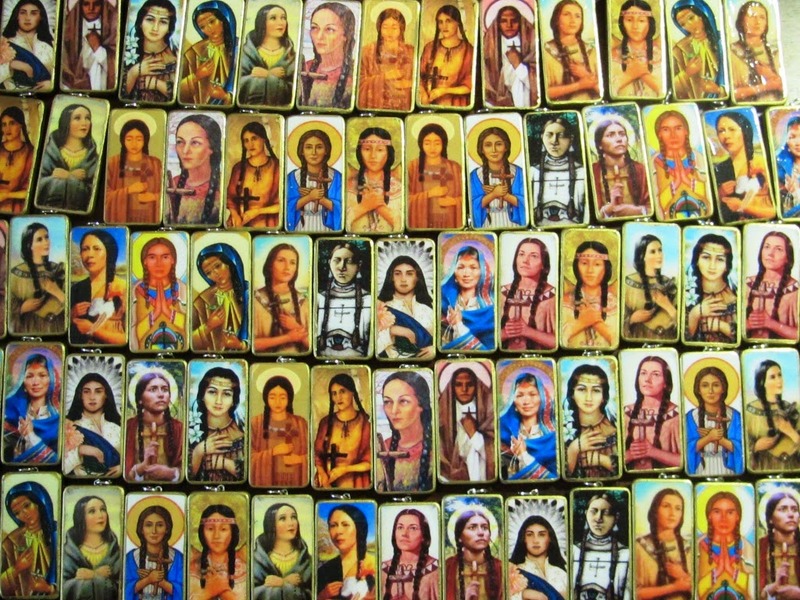 St. Kateri Tekawitha wood cross necklaces in process for a St. Kateri Tekakwitha conference this summer. 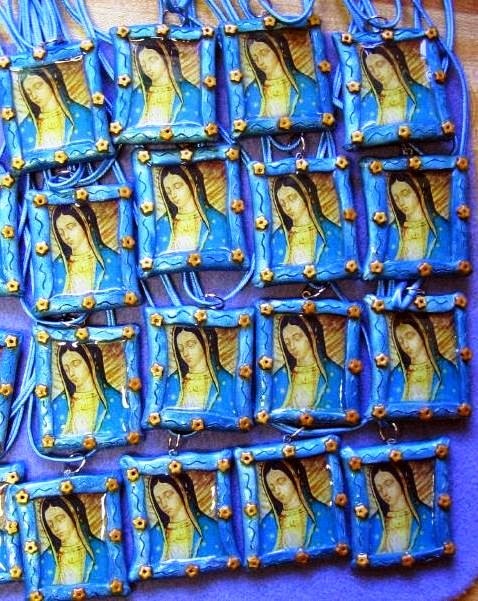 Our Lady of Guadalupe polymer clay necklaces made for a church group in Texas. 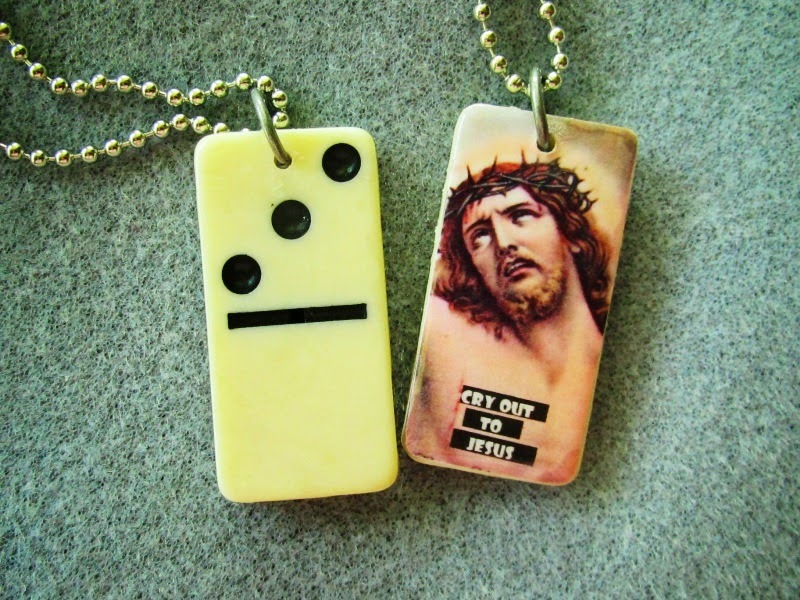 Last week, I designed and made domino pendants and key chains for the Christian band, Third Day. The dominoes featured images of the crucified Christ with the words of one of Third Day's songs imposed over them - "Cry Out to Jesus." Needless to say, the band loved the designs. 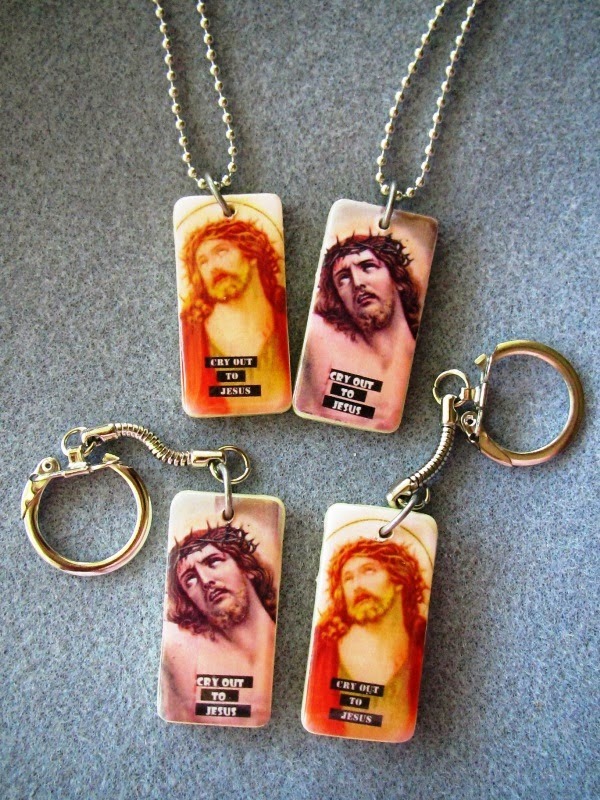 Domino key chains and necklaces made for the Christian band, Third Day, June, 2014. Domino necklace detail made for the Christian Band, Third Day, June, 2014. All in all - if you create things as a part of your business and have pondered about whether to take custom orders - I'd say, "go for it". Take it from me. You never know what it can do for your business and your sales. Labor Day Sale Plus FREE Domino Pendant with Purchase! ~*~ LABOR DAY WEEKEND - FREE WITH ANY PURCHASE - DOMINO PENDANT !!! 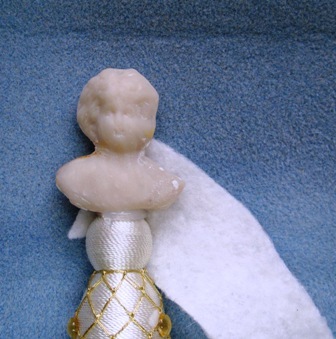 ~*~ Plus 15% off on all items in my EBay and Etsy stores (except custom orders). This weekend only - purchase any item from the Two Crafty Mules EBay or Etsy store and receive a FREE domino pendant (my choice). There is no minimum purchase. Retail value of this item = $12.99. To claim your item, just type FACEBOOK in the note to seller section on Etsy or EBay and a fabulous domino pendant will be yours! Don't forget your coupon code and you'll have yourself some nice savings and freebies too!! Free with purchase promotion ends Monday, September 2, at 11:59 pm. 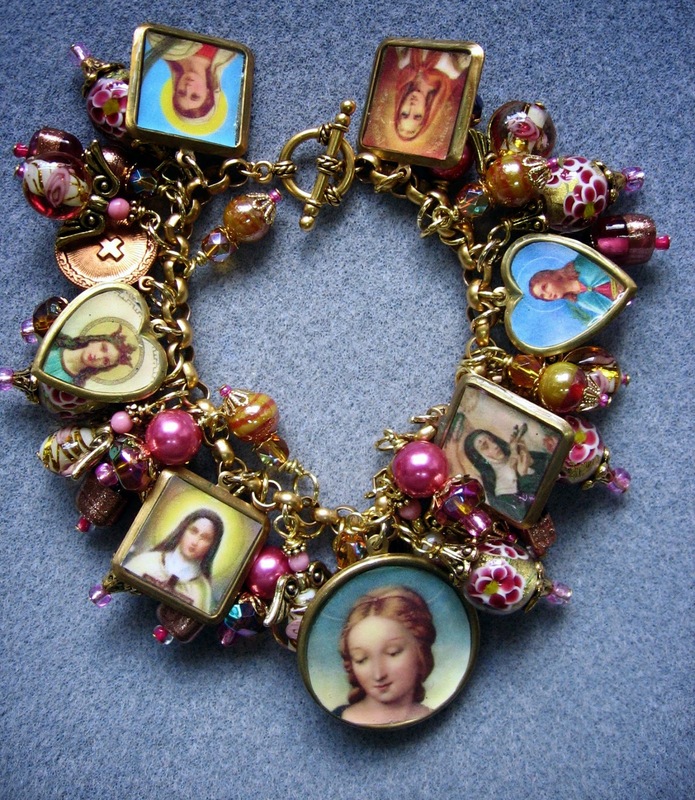 Also - I'm making tons of new items - including loaded charm bracelets - which will be posted within the next week. Be sure to look for them! Throughout my lifetime, I was always very close to my maternal German-Polish grandmother, my "Oma". She left us in 1999 from complications brought on by diabetes, but there isn't a day that I don't think about her. I think Oma is the one who inspired my crafty side. Ever since I can remember, she was usually making a new dress at her vintage 1940's sewing machine (a gift to her from my grandfather for their anniversary one year), knitting, crocheting or baking. Her passing left a void in my family that can never be filled. Sadly, my own mother has been quite ill lately, also suffering from diabetes complications. 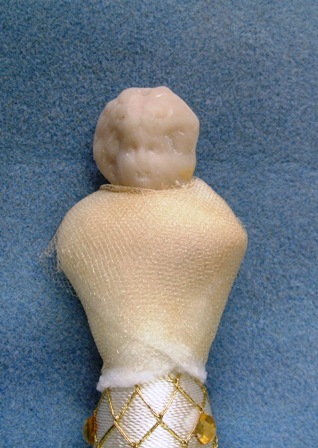 She recently had her leg amputated and is still at home in Arizona recovering from the surgery. I wanted to do something extra special for her this year for Mother's Day. I decided to incorporate images of my Oma (my mom's mom) into a little memory quilt that she can display and enjoy all year long. I cut apart vintage purple and white floral hankies and arranged them "crazy-quilt" style into a pleasing arrangement. I also added images of my Oma that I printed from my computer onto fabric and incorporated them into the design. Once all of the pieces were sewn into place, I embellished the quilt with buttons, trims, lace, fabric flowers and the like. I mailed my mother the quilt earlier this week to ensure she'd have it in time for Mother's Day. She received it yesterday and said she cried when she opened her present. I'm glad that I was able to do something for my mom to give her a little happiness during this really rough time she is experiencing. If you are a mother, I want to wish you a heartfelt "Happy Mother's Day". It's been said that there is no love like a Mother's love, and I really think that's true. Have a wonderful weekend and enjoy your day! P.S. 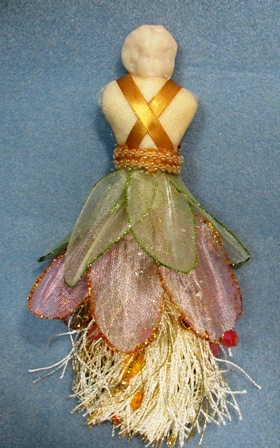 I want to credit quilter Cindy Brick for the inspiration behind my quilt. Years ago, I purchased her "Hanky Panky Crazy Quilts" book that utilizes the concept of repurposing vintage hankies into quilts. I own hundreds of craft and sewing books, but this one is still at the top of my favorites list. If you'd like to see other hankie quilts I've made that are available for purchase, please check them out on my Etsy store, Retro Eclectica. Youth Bridge is a non-profit agency in Arkansas that serves youths and their families in the areas of neglect, abuse, addiction, homelessness, mental health issues and behavioral problems. When my son told me about Youth Bridge's annual art fundraiser and auction- "Almost Van Gogh" - I couldn't resist the challenge of participating in this very worthwhile event. This year's event focuses on the importance of art therapy. As one who regularly makes art as a way of "de-stressing" from everyday life and it's issues, I can totally attest to the value of art therapy. This challenge invites local artists to create their own version of a Van Gogh, or paint something in the style of Van Gogh. Each participant is given 3 colors of paint (my colors are black, white and red), 2 paint brushes and a 14" x 18" canvas to work with. 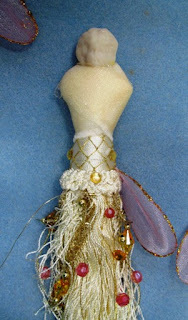 Artists can use any other products (not paint) to color and decorate their art. I decided to make my version of Van Gogh's Poppies. I painted the background with a mixture of white paint, alcohol ink and heavy gel medium to achieve texture. 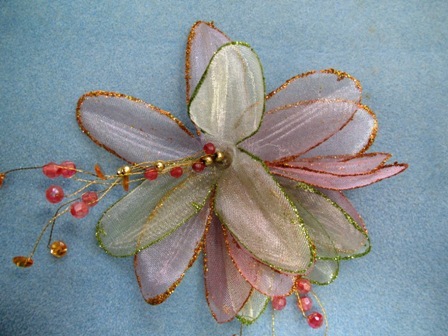 I then used punchinella (sequin waste ribbon) as a stencil and sponged red highlights over the background. Colorful scrapbook paper was cut into little squares for the mosaic-style table and vase. 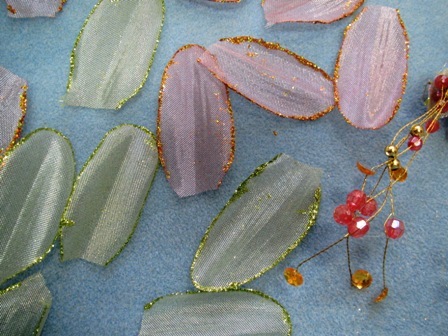 Pretty silk purple poppies, leaves and filler flowers were used to complete the design. Last, but certainly not least, I used a touch a red and black paint and glitter glue to add highlights to the bouquet. 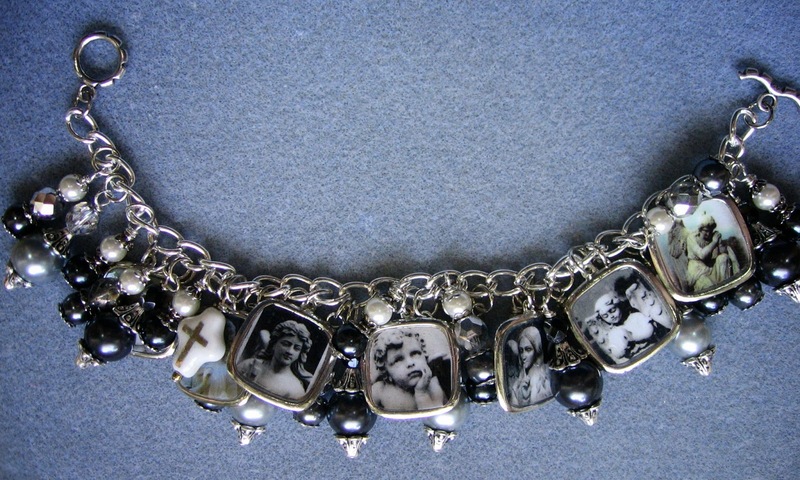 One of my regular customers who is a fan of Saint Rita asked me to make a recycled domino bracelet featuring images of just this saint. 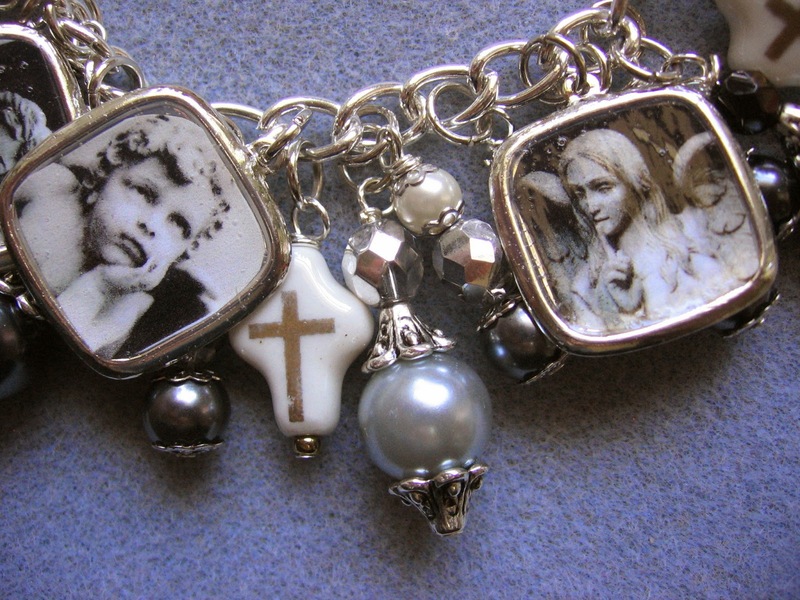 True to form, I can never stop at making just one of something, so I made three other bracelets dedicated to just one saint. 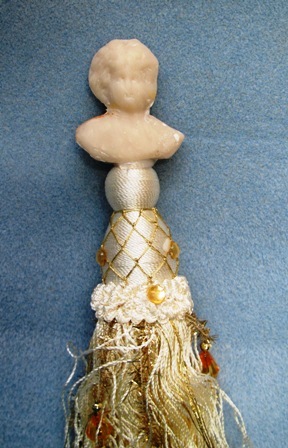 ...and the one that started it all, St. Rita. 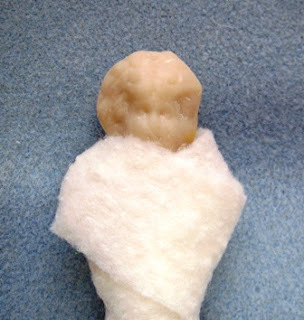 I can't believe it's been two whole weeks since I last blogged. My gosh - between my son's wedding two weeks ago and Thanksgiving the following week (the week I made THREE turkeys - one for home, one for the office and one for my son's gathering), the days have passed by in a blur! Wow! I'm pooped just thinking about it! Over the weekend, I had some time to work on some retro Christmas bracelets. I absolutely adore the images from 50's and 60's and couldn't resist incorporating these into my latest creations. All of the bracelets feature images from vintage Christmas cards and retro gift wrap decoupaged affixed onto wooden disks. 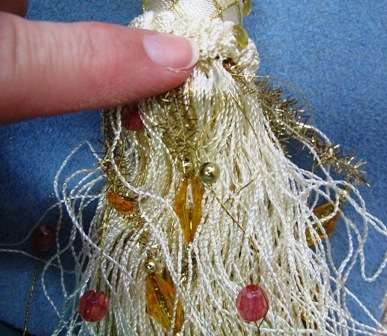 The beaded dangle charms consist of Christmas tree garland that I disassembled and made into charms. Pretty cool, huh? Like potato chips, I couldn't stop at just one, so I made a whole gaggle of these bracelets and posted them to my EBay and Etsy stores. 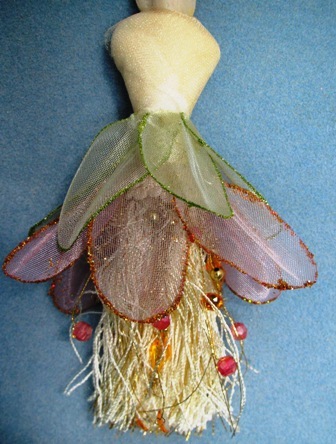 I have a myriad of Christmas projects I want to share with you in December. 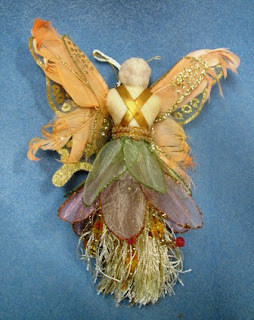 Please check back often for some really neat handmade gift ideas and tutorials this coming month.